Microsoft is rebranding its Bing consumer apps as MSN apps and bringing them to iOS and Android devices. It also is revamping the MSN.com portal. Microsoft officials said to expect the handful of Bing consumer apps -- which Microsoft is rebranding as MSN apps -- to come to iOS and Android "in the coming months." These touch-first apps, which include News, Weather, Travel, Finance, Sports, Health & Fitness, and Food & Drink, are currently available for Windows 8 and Windows Phone 8. 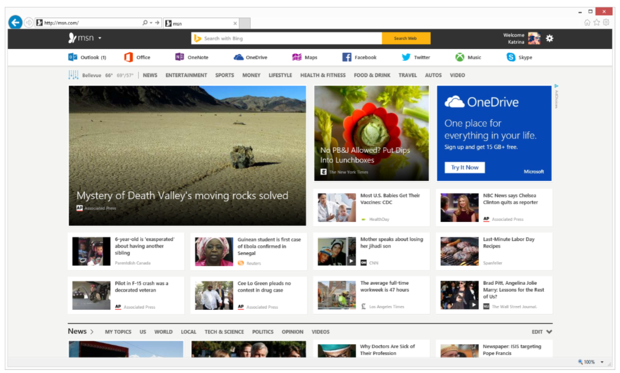 In other MSN news, Microsoft is launching on September 8 a preview of a revamped version of its MSN.com home page that highlights many of the same consumer-focused topics. That preview will be available to users in 55 markets, starting today, at preview.msn.com. 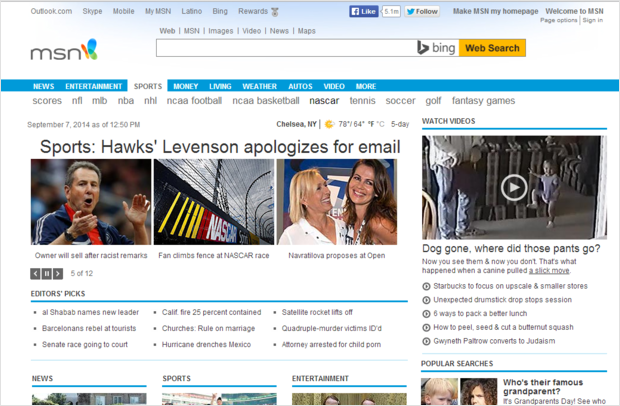 Microsoft expects to remove the "beta" tag from the new MSN.com site "in the coming weeks," a spokesperson said. "Information and personalized settings are roamed through the cloud to keep users in the know wherever they are," said Brian MacDonald, whose new title is Corporate Vice President of Information And Content Services, in a blog post outlining the MSN news. Microsoft has been grappling with what to do with its MSN.com portal for years. Around 2007, the company came close to abandonning MSN.com, but then decided to turn the MSN.com hub into a place where it could integrate more social-networking tools and pre-programmed content. In 2010, Microsoft launched a new version of MSN.com that delivered on those goals. In 2012, Microsoft revamped MSN.com again, and fielded a touch-optimized version of it to users running Windows 8, Windows RT and Internet Explorer 10. The touch-first version, which had a Metro look and feel, also included refreshed versions of the core MSN sites, like news, entertainment, sports and money. According to Microsoft, MSN.com has a worldwide audience of 437 million. For the past couple of years, Microsoft's MacDonald has been spearheading the "Bing AppEx" (Applications Experience) team at the company, which ws charged with building consumer-facing, Bing-power apps and services for Windows 8 , Windows Phone 8 and Xbox. Some members of that team recently built a celebrity-tracking app for iOS, known as Snipp3t. Microsoft already offers a few consumer apps for iOS and Android, including the Bing search app, OneDrive cloud-storage app and OneNote note-taking app. These apps weren't built by the Bing AppEx team and won't be rebranded as MSN apps. Microsoft, Windows Live Mail is a freeware which works on all versions of Windows. Sometimes, the platform fails to face all the challenges of user. It is suggested to contact Live Mail Support services which are always best and extraordinary. We are a team of experts, technicians and certified professionals who are fully focused to solve each and every query on particular technology and provide complete assistance with customers’ satisfaction. Do not get worried if you are dealing with Live Mail technical glitch, just call at our toll free Microsoft Windows Live Mail Helpline Number and get connected with one of our experts.